Every now and then, when I see images of old trains, I ask myself whether there is much interest in that form of travel anymore. Millions of children eagerly watch the television adventures of Thomas the Tank Engine, and some of them may see The Choo Choo Bob Show. On PBS, adults can view documentaries about iconic old routes like the Trans Siberian Express and the Durango narrow gauge mining network in Colorado. But the big excitement for most people relates to other forms of travel such as the space ships in the movie Star Wars, space capsules, and big airplanes like the Boeing 777. Even luxury cruise ships seem to attract more interest than trains. But perhaps there are still people who appreciate old railroads. I hope so, because I want to talk about the role that trains have played in my life. I was born in Providence, Rhode Island, in 1943. I believe that my love of trains began even before I was born. In 1942, my father, then twenty one years old, was in his second year of service in the U.S. Navy Medical Corps, working as an Operating Room Technician at the military hospital in Providence. At the time my mother was still in the East Bay Area of California, where the two of them had grown up, met, and married shortly before the start of the Second World War. When my mother became pregnant, the Navy paid for her and a friend to travel across the United States by train so that I could be born in my father’s presence. I have no conscious memory of that trip, but I am convinced that it was the experience that first made me love to travel by rail. My mother and I lived in Providence with my father until he was assigned to be the entire medical department on a Navy destroyer that was directed to make its way south through the Panama Canal and then perform combat duty in the Pacific. Then for a while my mother and I lived in New York in the Bronx, where her father, recalled into the Navy, was imparting his experience as a gunnery officer to new recruits at the Brooklyn Navy Yard. My next encounter with travel by rail occurred when I was eight years old. My mother, my five-year-old sister, and I were living in the Bay Area and my father was at sea on a Navy transport serving in the Korean War. We got word that his ship would be anchored for the summer of 1951 in San Diego Harbor and that it would be possible for the four of us to live together in San Diego during that time. My father came up to the Bay Area from San Diego to accompany us on the train trip south. We put some of our belongings in storage, packed the rest in suitcases, and were driven to the railway station in Oakland by my mother’s parents. They waved goodbye to us as we boarded an enormous, chugging Southern Pacific passenger train, The Lark, to take us south. It is my first conscious memory of riding overnight in a rail passenger car — the lights passing by us outside the window of our safe compartment, the sounds of whistles and of bells at crossings, the constant rocking motion, the buttons and doors and secret spaces inside the compartment, the smell of fresh bed linen, and the certainty, whenever the porter answered our buzzer, that we were royalty. For my sister and me, the summer in San Diego was hot and boring. I did enjoy some fascinating visits to my father’s ship and the harbor area. But otherwise I was anxious to leave. Finally at the end of the summer we received news that we would be returning to the Bay Area where my father would be stationed at Mare Island Naval Shipyard in Vallejo. Within the week, we were on our way north. This time we went by plane. I had never flown before. The experience was an adventure. I even had the good luck to be invited into the cockpit and sit in the pilot’s lap and pretend I was steering. You would not be allowed to do that today. We were on Pacific Southwest Airlines, which had been founded by a World War II pilot and was only a couple of years old at the time. The owner happened to be acting as the co-pilot that day. He was fond of children and also knew how to please customers. But the most interesting thing to me about the flight, looking back, is that it did not enchant me the way my first train trip had. After a few months at Mare Island, we got word that my father was being assigned to go north by ship to the Navy base in Bremerton on the west side of Puget Sound, where he would be serving at the large naval hospital. My mother, my sister and I would take the train north and move into the base housing that was being arranged for our family. My mother’s parents, by that time relocated to the East Bay, drove us to the Southern Pacific station in Oakland where my mother, my sister and I boarded a train that went all the way east to Salt Lake City. There we transferred to the Northern Pacific line and made the rest of the journey to Seattle. 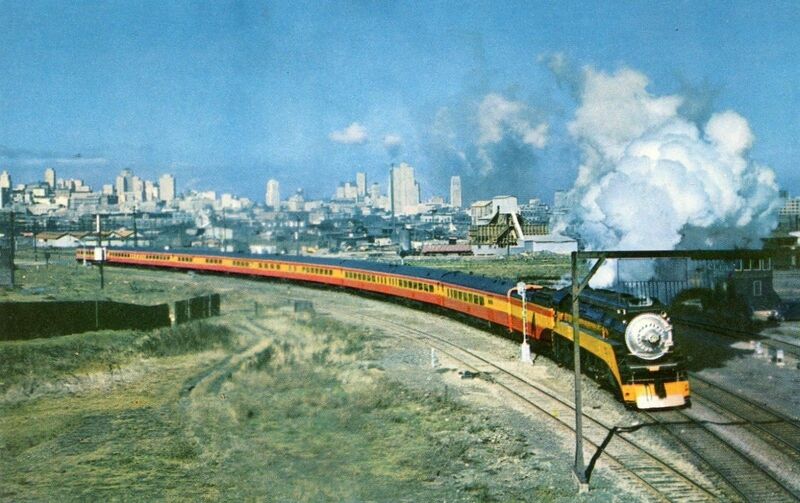 The Southern Pacific train was sleek and modern. 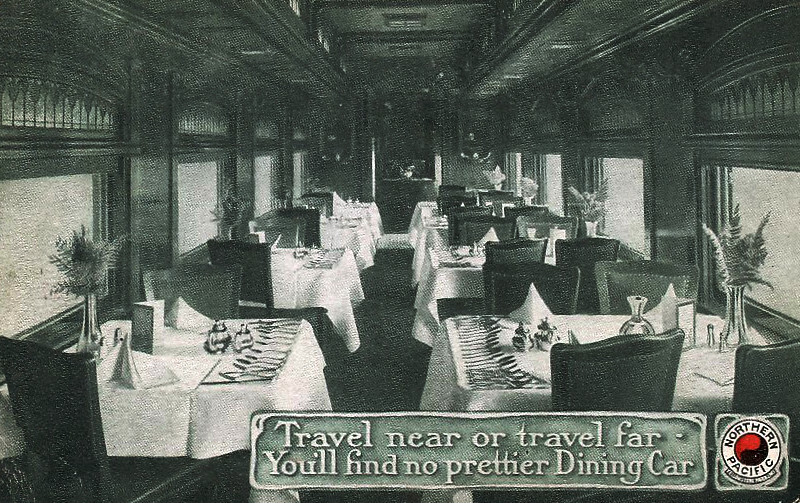 The Northern Pacific train was in good condition but very old in its decor, most noticeably in the dining car which had walls of brown wood, brass lamps on each table and red, cut glass chandeliers. This was my first encounter with fingerbowls. When the waiter put them on our table I thought they were rose-flavored cups of water for us to drink and I was lucky that my mother explained them to me in time. 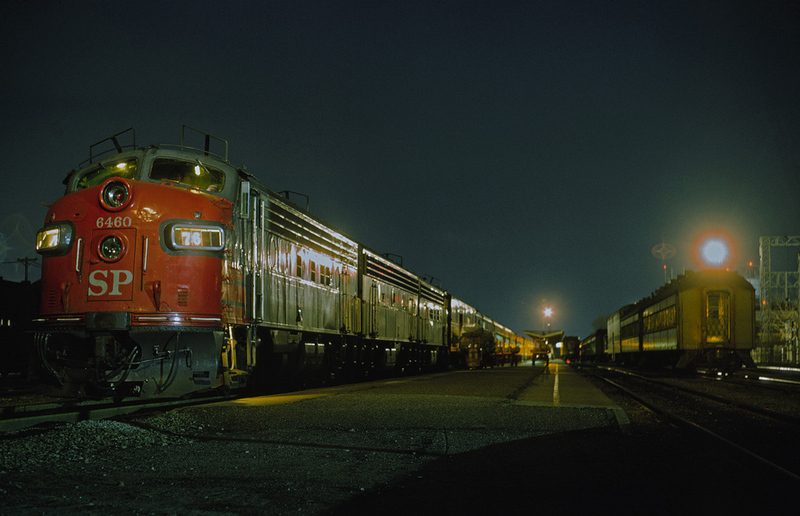 The last and final train trip of my early boyhood was the return journey from Seattle to the Bay Area after we had lived in Bremerton for about two and one half years. From that time on there was no need for long distance family travel because my father was able to get tours of duty at various Navy installations in San Francisco and Oakland. My next train trip was therefore voluntary. In 1959, when I was in the tenth grade at Berkeley High School, my best friend Steve and I got jobs selling souvenir programs on Saturdays during the UC-Berkeley football season. We were good at it. So, when the news swept the Bay Area that Cal’s great football team would be going to the Rose Bowl, the supervisor of program sales invited Steve and me to be part of the small group of high school students who could hawk our wares in Pasadena. Steve’s parents arranged for us to stay with friends of his family in Los Angeles. Soon thereafter we were on board a Southern Pacific train heading south. The trip took about twelve hours. It went down the Central Valley, stopping at numerous farm towns with names I found exotic, like Tipton, Tulare and Cucamonga. During a long, flat portion of the trip we went through the southern portion of the San Joaquin Valley at speeds of ninety miles per hour. The track bed was old and seemed not to be in good repair. Our train vibrated precariously but gave us all a good adventure. 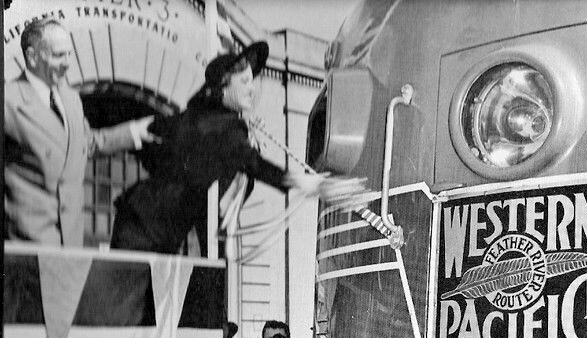 The train had a couple of Vista Dome cars, the kind that were always featured in ads in the Saturday Evening Post and other magazines of the era. The cars provided the part of the trip that was the most fun. They were filled with UC Berkeley students and several young musicians. Most wore white wool sweaters decorated with blue and gold UC Berkeley insignia. Everybody sang the famous Cal drinking song: “California, California, the hills give off their cry, we’re out to do or die, California, California, we’ll win the game or know the reason why.” This is just a part of the lyrics. The whole song takes around ten minutes; longer if you are drunk. Many of the students drank beer as they sang. Steve and I ordered Coca Cola. After the Rose Bowl and a few days with Steve’s family friends, it was time to take the train back to the Bay Area. This trip was quiet. Everybody was tired. I slept part of the way but also managed to catch up on reading for my high school World History class. My next big train trip occurred in 1964. I spent the summer of that year in Washington DC as a college intern at The Pentagon, thanks to a wonderful, generous program called Stanford in Washington. At the end of the summer, I drove across the country to Mesa, Arizona, with a college friend who lived there, and then boarded a Santa Fe train to take me north to the East Bay. There was a flash flood in the desert along the way, adding three extra hours to our trip while the train proceeded slowly and cautiously at each large gulley. The high point of the journey was the conductor. He had taught himself the history of the area and told us fascinating stories as he stood at the front of the our car and pointed out sights. 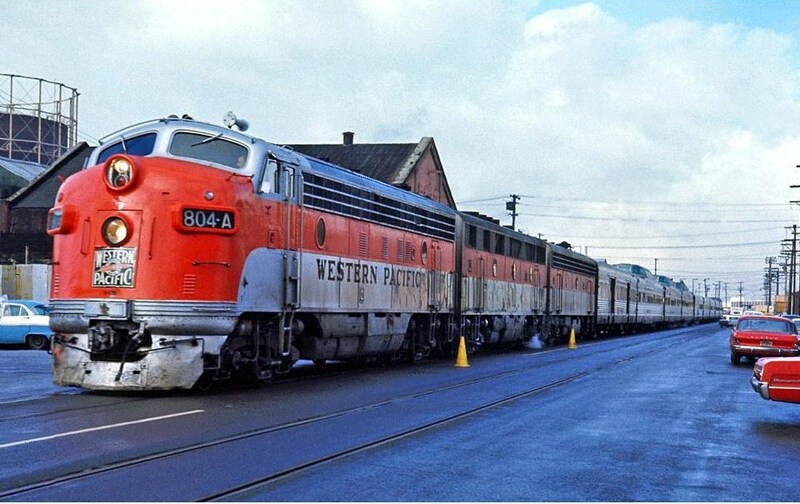 My last experience with train travel as it used to be came in 1971, after I got my Ph.D. in History at Harvard and returned to the Bay Area to look for a job. Because I needed several months to find employment, I had a lot of spare time. I spent a great deal of it with a classmate from Stanford, Bill Moore, who was working as a reporter for the San Francisco Chronicle. Bill had grown up in Arizona and had numerous memories of old trains. He had flair and an amazing ability to attract groups of people for bizarre adventures. 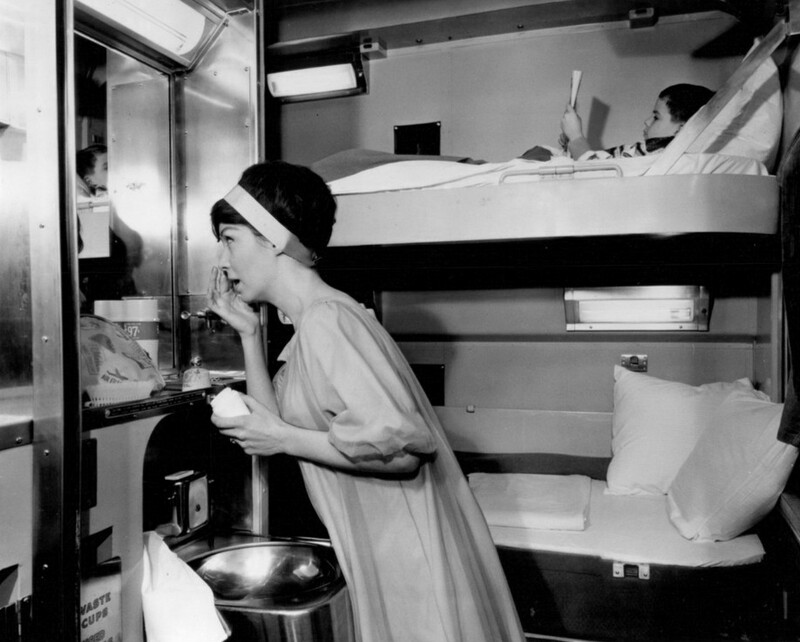 One of his favorite activities was to organize Bar Car Expeditions. We would board the southbound Southern Pacific train in Oakland, have many drinks and tell stories in the bar car, enjoys the views of the brown hills dotted with Live Oak trees, get off in Santa Barbara, wait twenty minutes, and then board the northbound SP train to take us back to Oakland. The scenery was gorgeous, the drinks were excellent, and the shared feeling of friendship was memorable. That’s about it. After 1971, when I got my own car, there was little need to travel by train. And I didn’t really want to travel that way. The old passenger lines like the Southern Pacific, the Northern Pacific and the Santa Fe went out of business and were replaced by AMTRAK. I do ride on AMTRAK from time to time and I feel a stubborn form of nostalgia whenever I do so. But it isn’t the same. While he was a reporter at the Chronicle, and before he became Managing Editor of the Sacramento Bee, Bill Moore won a prize for an article he wrote about the last run of the famous Western Pacific train the California Zephyr. 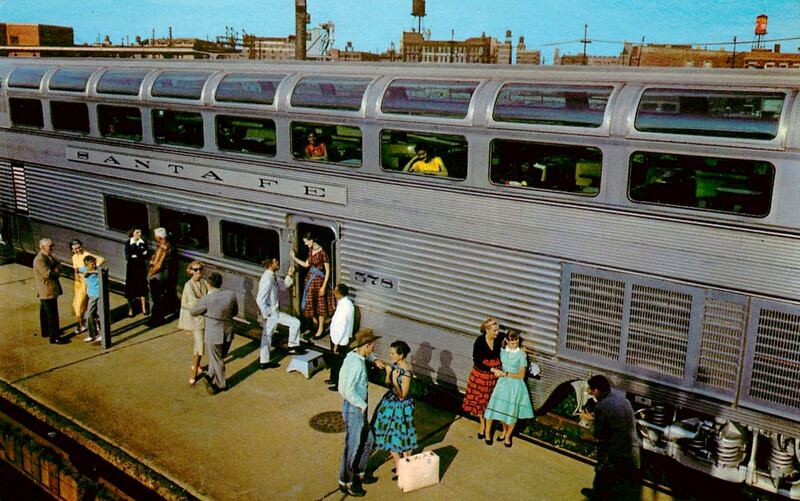 I never had the pleasure of riding on the Zephyr, but I sometimes encounter it in my dreams.